Placing an order with Ablectric.com for any product shall constitute acceptance that you agree to our standard terms and conditions as set out below: If you do not wish to be bound by these terms and conditions please do not place an order with www.ablectrics.com. 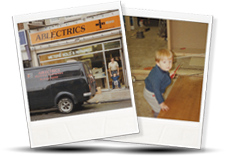 Ablectric, Showroom and Offices at 131 Gloucester Road Bishopston, Bristol, BS7 8AX. These terms and conditions apply to sale of all goods supplied by www.Ablectrics.com registered office address; 131 Gloucester Road, Bishopston, Bristol, BS7 8AX. Once we are in full receipt of your order and we have cleared funds there is a binding legal contract between us. Once you have placed your order you will be notified via-email. As stated in 1.2 once payment is received in full you are bound to contract and you have entered into a legally binding contract which is subject to our terms and conditions. We have the right to amend or alter our terms and conditions at any given time without giving you ‘the customer’ any notice. Our displayed prices are inclusive of VAT. We have the right to alter prices and goods displayed on our website at any time. All products shown on our website are subject to availability. We endeavor to inform you if any products you’ve ordered are out of stock or discontinued. You will be offered a refund or a possible alternative product which may be suitable. We endeavor to ensure all displayed prices on our website are accurate however, if a product is priced incorrectly we will contact you as soon as possible and offer you the opportunity to replace your order. If the price displayed is showing significantly lower than correct price and therefore the discrepancy is vast we have the right to cancel your order. If your order is cancelled by either party you will be refunded or at your request offered an alternative. In some circumstances you may be required to pay an additional delivery charge. All measurements and descriptions are for guidance only and are subject to alteration and modification without prior notification. Please be aware that colour/finish of the product and may not be a true likeness. A small percentage of products require you ‘the customer’ to assemble and/or adjust before installation. Most Crystal fittings require dressing (hanging the Crystals from the frame).Crystals are sometimes packaged separately to the light fitting itself. The main reason for this is safe transportation of product. If you require over the phone assistance we are always happy to help. We accept payment for the goods and delivery charges via our website universal gateway payment system, bacs payments, or cheque. However, all funds must be cleared before goods are dispatched. If you pay by cheque you must allow up to 7 working days for the cheque to clear. Payment must be made in advance and at the time of placing the order. No goods are dispatched until cleared funds are received in our bank. We reserve the right to refund you in full at any time prior to goods being dispatched. All payments shall be made by you for the amount stated on your order. We do not accept orders which total more than £1000 via card payment. To process a large order you will need to transfer the funds into out account. You can still make the order on line and then chose the bank transfer as a payment type. Please phone us if you have any problems or need assistance with this. Orders placed for collection, only a 20% deposit is taken. The balance is to be paid on collection in the shop. We do not accept Cheques. Whereby, you ‘the customer’ refuses delivery of your goods as per Distance Selling Regulations we agree to refund or re-credit you within 30 days for any sum that has been paid by you or debited from your bank, less any expenses incurred for return carriage costs. A failed delivery whereby you have not been at your stated delivery address to accept delivery of the goods or did not provide alternative delivery instructions in advance will result in your payment being refunded minus delivery cost incurred by us. Once you are in receipt of your goods you will be asked to sign for the goods which is your acceptance that the goods are in good condition. If you are unable to check the contents of the package please ensure you sign for the goods “UNCHECKED". If you do not do this it may result in any future claims that you make thereafter. Upon receipt of your order you must immediately check for damages and or shortages. Claims for damages and or shortages have to be made within 7 days of receipt of your delivery. If goods are returned to us at any time they must be in their original packaging and undamaged. Liability for the goods are at your risk from the time of delivery and if they are to be returned must be kept in a dry and safe environment. Refrain from disposing of any packaging, refrain from marking or defacing any packaging or the goods themselves. Store the goods in a dry and safe environment. Ensure the goods are insured on the Supplier's behalf for their full price. If we request you are able to supply us with a copy of your insurance certificate. Any business customers right to possession of the goods shall terminate immediately if: A bankruptcy order has been made against you or you are in the process of liquidation/administration (whether voluntary or compulsory against you or you are unable to pay your debts within the meaning of section 123 of the Insolvency Act 1986 or you cease to trade;. You the ‘customer’ are within your rights to return or cancel your contract with us www.ablectrics.com at any time within the first 7 working days after you are in receipt of the goods. However these rights are null and void if the goods have been fitted, assembled or modified in any way. You must return the goods in their original packaging and the goods must be in the same condition upon which they were received. Any goods which have been actually manufactured specifically for you ‘the customer’ cannot be returned for credit. If you wish to return any goods from www.ablectrics.com you must email us [email protected]. Whereby you decide to return products to us it is your responsibility to return the goods to us www.ablectrics.com at your own cost. We will not refund you for the costs incurred by you to return the goods. The goods must be returned to 131 Gloucester Road, Bishopston, Bristol, BS7 8AX. It is your responsibility to ensure the goods are not damaged in transit and that we receive them in the same condition upon which you received them. Under the circumstances whereby you do not return the goods as required, we are within are rights to charge you a sum not exceeding the direct costs of recovering the goods. Upon receiving authorization to return goods to us you must do so within 21 days from the date of us accepting the cancellation of the contract. Please be aware that the consumer distance selling regulations do not apply for Business to Business transactions. All products supplied by us carry a 12 month warranty although this does not affect your statutory rights. Your warranty does not apply to the following: any minor or major defect in the goods arising from general wear and tear, damage with intent, accidental damage, any form of negligence by you or any third party, whereby the goods have been used in any other way other than recommended by the Manufacturer. If you fail to conform to these instructions, or attempt any alterations or repairs to the goods without our approval your warranty is null and void. Whereby your goods are received and you discover they are damaged you must notify us in writing via the e-mail ([email protected]) or fax within 7days. Upon returning damaged goods you will initially be responsible for returning the goods to us at your own cost. Once we are in receipt of your goods and we confirm the goods are ‘damaged’ you will be issued with a refund for the carriage costs incurred. It is your responsibility to ensure the goods are not damaged further during transit. If you suspect your goods have a defect during the 12 month warranty or you are unsatisfied with the goods during the first 12 months please contact us in writing via the e-mail address ([email protected]) or fax. If this contact with us results in you returning the goods to us you will be responsible for ensuring we receive them in an undamaged state. You will also bear the cost of returning the goods. As long as the goods are returned as required you will be refunded for the carriage costs incurred with 30 days upon us receiving the goods. Please be aware you need to obtain quotes for the return carriage and have our agreement prior to returning the goods. It may be more financially viable for us to collect the goods from you and charge you in advance and then refund you in future subject to the terms stated above. Be aware that goods returned under the 12 month warranty will be subject to a full inspection before replacements are dispatched or repairs carried out. Occasionally we may have to return the goods to the manufacturer/s. Of course we aim to carry out this procedure as quickly and thoroughly as possible. Please be aware that if the goods are not be faulty or we discover they have been subject to misuse or they have been installed incorrectly we will have no alternative but to return the goods to you ‘the customer’ at your cost. All anti corrosion guarantees are dependant on geographical location and you must adhere to the manufactures guidelines. Unfortunately, some costal regions will have an effect on the anti corrosion properties of some products and may therefore invalidate the anti corrosion guarantee. Further information can be obtained from www.ablectrics.com prior to you making your purchase/installation. It is your responsibility to ensure the goods are installed correctly by a qualified electrician. Please be aware that as of 1st January 2005 any installation maybe subject to Part P of the current building regulations. Your local building regulations office. If you install the products yourself it may result in your warranty being invalid. Please ensure your products are installed by a qualified electrician. Our liability limitation is limited to the price of the goods and nothing exceeding that amount. Our total liability as per our terms and conditions which includes, negligence or breach of statutory duty, performance, misrepresentation. All Business customers we www.ablectrics.com are not be held liable to you for any type of loss or damage, whether for loss of profit, loss of business sales, affected goodwill, costs, expenses or any other claims for consequential compensation whatsoever. Our terms of sale and the supply of the goods to you are all subject to English law and the English Legal System. English courts will have full jurisdiction in respect of any dispute arising from a contract made between www.ablectrics.com and ‘the customer’. Please be aware all content in our terms and conditions is the copyright of www.ablectrics.com and we reserve the right to take legal action if any person(s) or business is found using the content found on Directlight.co.uk web site without permission in advance. Please also be aware that www.ablectrics.com is trademarked and any business or individual attempting to profit or benefit in any way with our name may be liable for damages and could if we so wish have a court injunction placed upon them. All prices displayed on www.ablectrics.com include VAT. As per our website our carriage is charged at the checkout. The customer is responsible for selecting the appropriate carriage for their goods. If the customer wittingly or unwittingly selects the incorrect carriage charge they will be informed. Please be aware that if this is in the customers favor then further charges will be deducted form their bank. If the customer has been overcharged for carriage then we will refund the customer within 7days. In the customers interest we regularly review and amend prices on our website to remain competitive and to offer the customer the best possible prices. We however have the right to without notice change prices any time on our website. These terms & conditions apply to our Price Beater form and in addition to the terms above. The competitor is a UK based registered company, trading through an ecommerce website with their own registered domain name that is not hosted on free web space. We are able to visit the competitor website and confirm details of products and prices. The product is not different to the equivalent product on our website, or from a different manufacturer. Competitor's prices must be clearly advertised on their website - this offer is exclusive of any promotions, discounts or sales offered by any competitor that does not reflect their usual selling price. Although we will consider beating the price of any competitor, this offer only applies to our list of our known major competitors. All Price Beater offers are subject to stock availability, returns policy, delivery charges and all our usual terms and conditions for use of our website. 16. You can now recycle your old electrical’s with us. The Waste Electrical or Electronic Equipment (WEEE) Directive requires countries to maximise separate collection and environmentally friendly processing of these items. In the UK, distributors (including retailers) must provide a system which allows all customers buying new electrical equipment the opportunity to recycle their old items free of charge. Those establishing their own take-back scheme must as a minimum offer all customers buying new electrical equipment free take back of their old electrical’s on a like-for-like basis. Under the Waste Battery Regulations, ElectricsandLighting.co.uk are now offering a take back scheme for all portable waste batteries. You can return your waste batteries to our business premises in person (PLEASE DO NOT POST). Our standard delivery cost is £4.99 to the UK mainland only. Ireland, the Channel Islands and parts of Scotland are not covered under this cost. Orders over £99 will be delivered free of charge to UK mainland addresses only. Some items are advertised as free delivery although less than £99, this is only to UK mainland addresses only. If unsure about our delivery costs please contact us to check. If you order something from us and we are unable to fulfil your order with the delivery cost the website has charged we will contact you straight away and offer you a full refund or the option to pay a little more to get the goods delivered. You can choose to collect your purchase from the shop. If our couriers are unable to deliver a parcel because nobody is there to sign for it, a maximum of two attempts will be made at the address before the parcel is returned to us at the warehouse. You will then be contacted and offered the ability to alter your delivery address or re-schedule. A second delivery charge may be passed on, this is at our discretion. If you cancel the order after we have dispatched it we will deduct the cost of the delivery from your refund, to cover the cost implications of the failed delivery/ dispatch attempt. We can deliver to Northern Ireland, Southern Ireland, Scotland and the Channel Islands, please allow an extra day for items going to the bellow addresses. · Scotland, shipping costs start from £10.00 * Not all parts of Scotland are affected by this increase and smaller items are sent via the royal mail. The exact shipping costs we incur from our couriers vary from item to item based on their weight and size, we can always check the exact cost of an order for you before you place your order with us. Delivery will take between 1-7 working days depending on the stock availability. If it is a stock item we can set a delivery date immediately. If you want to check an item is in stock please do so before ordering it. All deliveries must be signed for and cannot be left with a neighbour. Items ordered from us with a value in excess of £250 will be marked with a label asking you too check the items fully before signing for them in good condition. If you sign for a box as undamaged and accept the goods in good condition and then find out they are damaged this may invalidate our claim with the couriers so we please ask that you take care when signing for expensive items and make sure they have travelled well. If any driver refuses to let you check your order simply sign for the box as damaged this will cover both of us in the event of a claim. You have to choose a delivery date when you are in and can except the delivery. We can deliver to you place of work if this is easier. If your item is broken you have 15 days to let us know. We will then raise a claim for the goods with the courier, a new item will be dispatched as quickly as we can obtain it. You may be asked to send a photograph of any damage and some couriers as part of processing a claim will ask to inspect the goods and packaging. Will will keep you informed and try wherever possible to minimalize any inconvenience on your behalf. You can also choose to have a full refund. This will include the delivery charge you would have been charged. Items are guaranteed for a minimum of 12 months from the date of receipt. If an item is faulty please contact us and we will arrange collection and redelivery. If we cannot re-supply the goods we will give you a full refund. This will include the delivery you would have been charged. If you order an item and cancel it you may still be charged the delivery fee. If you want to cancel a delivery please do so by email as soon as possible. If the item has already been dispatched you may still be charged the delivery fee. If you wish to return an item which has already been delivered it must be in the original packaging and returned to us within 14 days. Please send all returns to us recorded delivery or via a courier. Before completing a transaction you will be asked to agree to all the terms and conditions so please make sure you are happy before doing so.